Sandhill Lake is a new residential development launched in early 2017. 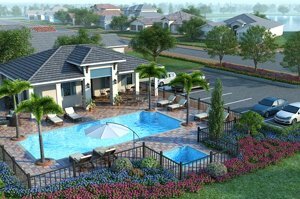 Its developer is the U.S. Assets Group which has built a solid reputation from the choice Sarasota homes for sale it has delivered. Its outstanding local residential property developments include Grand Oaks in Venice and the high-rise Beau Ciel in downtown Sarasota. A unit of U.S. Assets, Heritage Builders has come up with an exciting selection of home designs well-suited for the Sandhill Lake parcel about two and a half miles east of Interstate 75. Just 43 home lots, many of which back up to a lake, were platted on this site occupying the block of 7733 Clark Road between Proctor Road and the Bee Ridge Road extension. 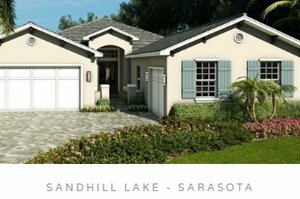 Prospective buyers of Sandhill Lake homes for sale will find an endearing mix of Coastal Florida, West Indies, and Spanish architectural style. Heritage Builders offers a wide variety of materials and finishes in these renditions, allowing customization of the residences to the taste and style of their owners. The floor plans of Sandhill Lake homes for sale range in size from 2,400 to 3,400 square feet, mostly in three-bedroom, three-bathroom designs. 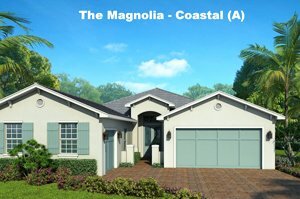 Magnolia, one of the models offered in this community and opened in August 2017 for viewing in sister development Ashton Oaks, is priced in the high $500s. Much creativity went into the designs of Heritage Builders as rendered in the exteriors and indoor living spaces of Sandhill Lake residences. Each home in the community is an expression of class and style with their flat, barrel-style concrete tile roofs that offer a paint selection of either soft or rich accent colors. Sandhill Lake homes for sale present a study in the latest trends in interior design and home finish. Inclusions in each residence range from eight-foot doors and tray ceilings with crown molding to plush carpeting, granite counter tops and custom hardwood cabinetry. Premium glass doors and impact-resistant windows come as standard features along with paver driveways and sidewalks for these striking inventory additions to Sarasota homes for sale. A gated enclave, Sandhill Lake further grooms its market appeal with the property’s lush landscaping and the lawn maintenance it provides to all residences. It likewise pampers the homeowners with several amenities in the community’s stylish Residents’ Club. This private clubhouse has a heated, resort-style swimming pool and spa, in addition to a kitchen, grill, fire pit with outdoor seating, and facilities for al fresco dining. Its lounge features soft seating and a flat screen TV, and furnishings are available for meetings and card games. More life and leisure activities are easily accessible to Sandhill Lake residents with their neighborhood’s convenient Clark Road location and proximity to Interstate 75. The activity centers within their easy reach include those around Sarasota’s downtown area and Siesta Key towards west via Clark Road. Points of interest in the Lakewood Ranch area towards north can be accessed conveniently too via the interstate. Property values at Sandhill Lake get some boost as well from the masterfully developed- communities around it. Northwest, its closest neighbors are the similarly small and close-knit communities of Trillium and East Lake. Wildgrass, a new community, is also rising east of Sandhill Lake, while towards southwest is the Preserve at Heron Lake. Sprawling towards north is the golf community of Heritage Oaks. Some market listings in these new and older developments could notably serve as comparables with Sandhill Lake homes for sale. Below are the current real estate listings available at Sandhill Lake.